On arrival from the UK, we shall transfer directly to the foot of Mount Etna, where we shall make our preparations in the rifugio ready for our trek. 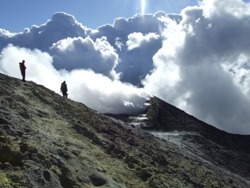 The trek will take a full day, around the Western flank of the mountain, and then over the top of Etna with a close approach to the amazing craters. The descent will be down towards the volcanic town of Linguaglossa which was formed on a tongue of lava.We will meet the tranfer to take us from the main road to the Hotel. The next day we take the coach to Milazzo for our ferry trip to Lipari. 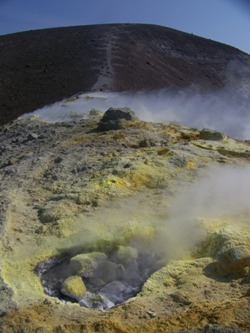 Once on Lipari there are optional excursions. One option is to take another ferry for an evening trek up Stromboli, or can keep it local and trek around Lipari Island. The end of the day we will have a celebratory meall ready for the next days departure. Final day we take the ferry back to Milazzo then board our coach to Catania ready for our flights. Drive directly to the foot of the mountain, for easy day, preparing for trek. You will be staying in simple hotels, and guesthouses, or Mountain Refuges. Generally Adventure Café provide a comfortable standard of accommodation on this trip. Expect Hot weather on Sicily, although it could be fairly cool near the summit of the mountain.